It's early morning and Sara is up to have breakfast before going to work and Frank is still up from spending the night gambling and watching cartoons. [sob] I miss NY bagels. Can you guys take another road trip and bring me some please? I tire of the "rolls with holes" that I am forced to eat here. I've heard certain things taste better in New York...bagels...pizza...when is the rest of the world going to catch up? I don't hear anyone talking about DC bagels. 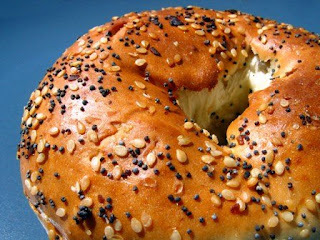 Of course, some of these bagels cost $2+ with cream cheese. It's starting to border on insane. speaking of sweet cream cheese, the other day i had a caramel pecan cream cheese on my bagel (don't ask)... it *was* really sweet, but surprisingly delicious. anyway, they often vend things as part of a collectible series and many things are of limited availability so in places like akihabara you can find stores (like the one i took a picture of) that have nothing but rows and rows of these machines so you can look for the things you want or for new/rare toys. We just got a NY Bagel store here. Sadly it's just not the same.